Counter top distillers range in price from $380 to $500, larger automatic units start at about $1700 and increase from there depending on the choice of storage capacity and accessories. What do you do about replacing the minerals removed? The minerals that exist in tap water are of an inorganic form and are not beneficial to your system. Minerals that your body needs are in an organic form that you would get from your foods and fresh vegetables. The distillers use about 3.2 kilowatts per gallon. Based on the national average electrical cost of 8.48 cents per kilowatt hour, this equates to approximately 28 cents per gallon. How big is it… will it fit on my counter? The countertop distillers are about the size of a large coffee maker. They will easily fit on a standard counter. The dimensions are approximately 10" by 16" by 15" tall when in operation. Is it OK to use softened water, since it says not to use salt water? Yes, the small amount of salt remaining in softened water will not hurt your distiller, in fact using your softened water will make it easier to clean your distiller, because most of the hard minerals have been removed by the softener. Water produced through steam distillation in combination with carbon filtration is some of the purest water available. Theoretically, pure water should have a neutral pH reading (7.0). But the very purity that should make steam distilled water neutral also makes it very sensitive to the addition of other substances. The near absence of dissolved solids means the smallest amount of any substance will dramatically change the pH of distilled water. How long do they last…and what is the warranty? Our distillers typically provide three to five years of uninterrupted, trouble-free service. These units are warrantied against defects in materials and workmanship for a period of one year from date of purchase. What materials are the collectors made of… and are they BPA-free? The material used in the Model 4000 collector is borosilicate glass and is BPA free. The material used for our Model 8800 is polypropylene. The collector/dispenser bottle of the 9000 is Tritan. Both of these materials are BPA-free. 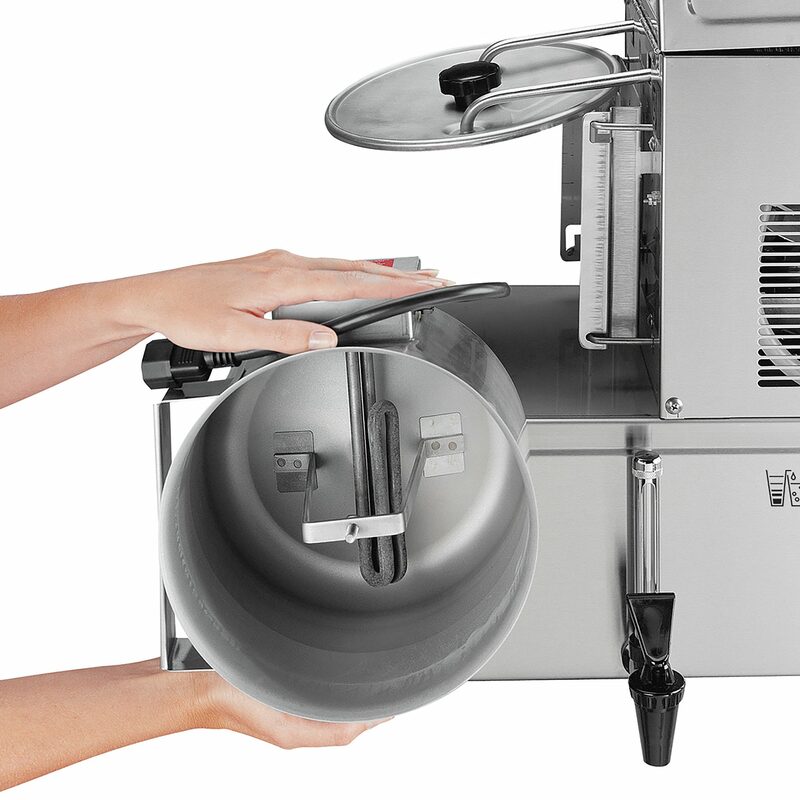 Our 7000 series is stainless steel and BPA-free, as well. Why aren’t all of your collectors made of glass? Borosilicate glass is not as readily available as it used to be and the unique shapes of our collectors make it more difficult and very expensive to obtain molds, etc., for our small quantities. It also takes several years to design, test, and get approval for new containers. And borosilicate glass, being very fragile, does not ship well, and is not as easy to handle. Does it remove everthing… minerals, vitamins, heavy metals, pharmaceuticals? Tap water is brought to a boil. Steam rises and enters the condensing coil. Cool air is passed across the condenser, converting steam back to pure distilled water. The distilled water then percolates through the coconut shell carbon filter and is collected. The process of steam distillation combined with carbon post filtration effectively removes at least 99% of impurities. Why do I need to use carbon filters… doesn’t distillation remove everthing? Will it work without the filter? Yes, it will work without the filter, but the volatile organic compounds found in the water can cause a bad taste, and could be carcinogenic. The post carbon filter will remove the VOC’s from the water and eliminate the bad taste. How much water does it make? One gallon of 100% steam distilled water is produced in 4 to 4.5 hours, up to 6 gallons in 24 hours. One gallon of 100% steam distilled water is produced in 4 to 4.5 hours. 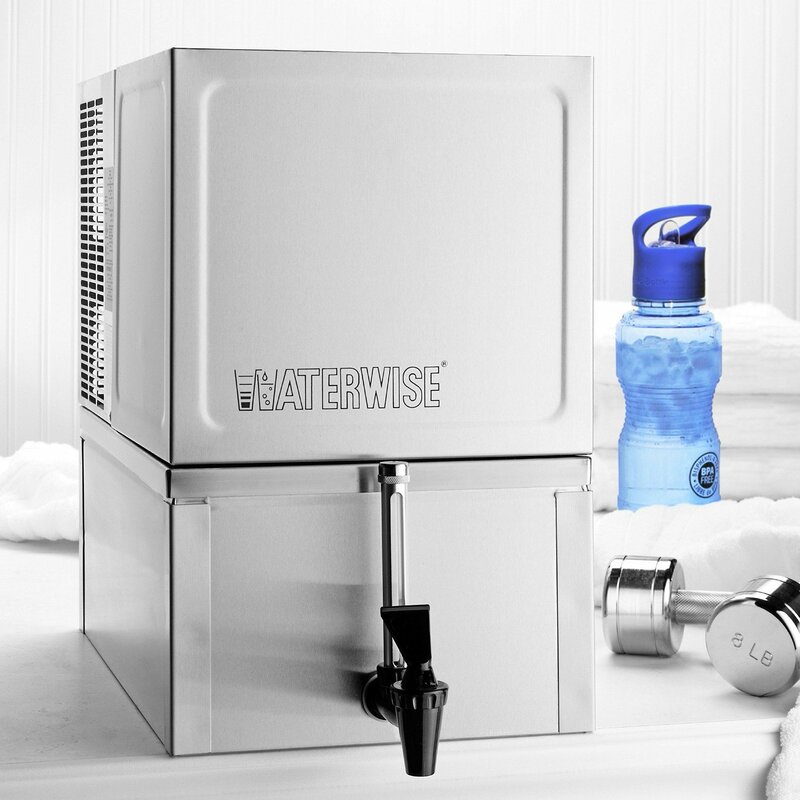 Without water, the 8800 weighs 14 lbs, the 9000 and the 4000 each weigh 10 lbs. The stainless steel 7000 series as follows: countertop 7000/3-gallon weighs 30 lbs., floor-standing 7000/8-gallon weighs 37 lbs., and 7000/12-gallon weighs 44 lbs. What materials are the distillers made from… are they BPA-free? All wetted materials are FDA rated. Boilers are 304 grade stainless steel (4000 and 8800) or a combination of stainless and high temperature polypropylene (9000). Condensing coils are 304 grade stainless steel. What is a “like new” demo? A ‘like new” demo unit has been tried by one of our customers and returned to us under our 100 day risk free money back guarantee. The distillers are fully tested, inspected, repackaged, and carry the same warranty and money back guarantee as a new unit. For optimum performance, you should rinse the boiler after every distillation cycle to remove any loose residue. As deposits build up, use an approved cleaner such as Kleenwise, for monthly cleaning—this frequency varies depending on the quality and hardness of the tap water and frequency of use. 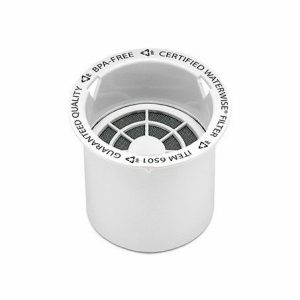 The carbon post filter cup should be discarded and replaced every two months or after 60-80 gallons of water processed(whichever comes first), or when undesirable taste/odor is detected. Shouldn’t I clean it every day… do I have to use Kleenwise? The boiler should be cleaned about once a month. This varies depending on the quality and hardness of the tap water and frequency of use. Rinse the boiler after every distillation cycle with warm tap water to remove any loose residue. 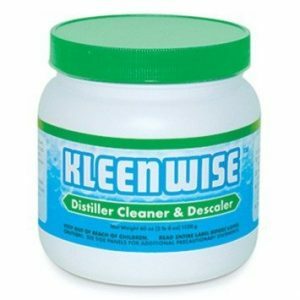 You may use our Kleenwise or a 1 to 1 ratio of distilled white vinegar mixed with water. What if the distiller breaks down… how do I get it fixed? If you have repair/technical questions about any of our distillers, please contact us via Email at service@waterwise.com or give us a call at 800-874-9028 Mon-Fri 9-5 ET and ask to speak to one of our onsite technicians. Why is distilled water better than alkalized water? Distilled water is the purest form of water available to the average consumer. Your body needs pure water to work at its optimum performance removing waste. Alkalized water has to have contaminants in the water to have the capacity to be alkalized. Water with pH above 7 has a tendency to make your system create more acidic conditions to offset the alkaline water, therefore it actually works in reverse to some information being circulated. What is the micron size of the prefilter? 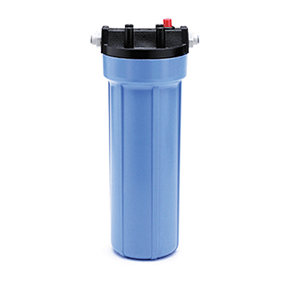 The micron size of our prefilter is 0.5 microns. 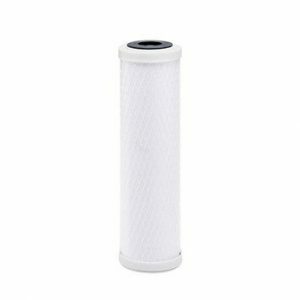 Why is carbon good as post filter for distiller, but not for shower filter? Carbon works very well to remove VOC’s as a post carbon filter because the flow rate is greatly reduced (1 gallon in 4 to 4.5 hours), thus the contact time is much greater, which is necessary for the adsorption of the contaminants. In a shower filter, the flow rate is at least 2 to 2.5 gallons per minute, which has a tendency in hot water to actually remove the stored materials from the carbon instead of removing them from the water. Why do you charge more than your dealers? Our authorized dealers are allowed to set their own prices and specials. Sometimes their specials are better than ours and we do not compete with dealer prices. If I don’t like it, can I return it? Waterwise offers all of its direct customers a 100 day, 100%, risk free, money back guarantee. If at any time during that period you decide to return it, call us and we will provide you with a prepaid return label to ship your products back at no cost to you. Waterwise warrants, to the original purchaser, this product against defects in materials and workmanship, excluding the disposable carbon filter and gasket, for a period of two (2) years from the date of purchase on all electrical and non-stainless steel components and fifteen (15) years from the date of purchase on all stainless steel parts. Defects or failures due to shipping/handling, incorrect installation, improper use or maintenance, including abuse or neglect, normal wear, water conditions, accidents, alterations or modifications, or unauthorized repair are specifically excluded from this warranty. No dealer, distributor, agent, representative, or other person is authorized to extend or expand this warranty. Waterwise is not responsible or liable for personal injury, property damage, or incidental or consequential damages arising out of, or in connection with, the use or performance of the product or other damages with respect to loss of use, or costs of removal, installation, or re-installation. Waterwise will, at its option, replace or repair the defective part(s) without charge, provided they are returned, transportation prepaid by owner, to an authorized service facility or to the address below. Enclose a letter describing the problem, copy of dated proof of purchase, and your name, address and daytime telephone number. This limited warranty does not guarantee uninterrupted service. Repair or replacement as provided under this warranty is the exclusive remedy of the purchaser. This limited warranty is in lieu of all other warranties, expressed or implied, including, but not limited to, any implied warranty of merchantability or fitness for a particular use or purpose. This warranty gives you specific legal rights and you may also have other rights which vary from state to state or province to province. Outside the United States, a different warranty may apply. For details, please contact your authorized Waterwise distributor.